Did you ever had a love/hate relationship with an Advent Calendar? Me neither. Until yesterday that is. 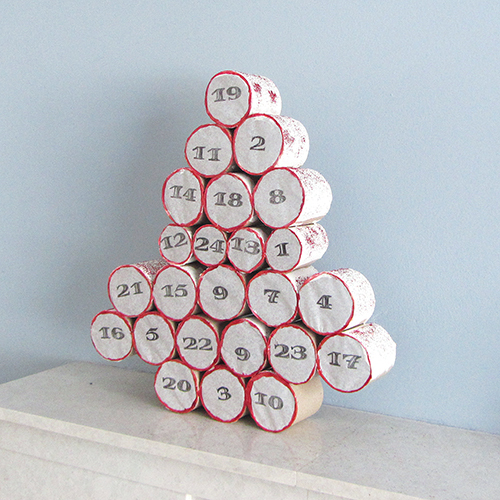 Here is the Advent Calendar I came up with over the week-end and I am not sure what to think about it. I got really inspired by Erlend at Morning Creativity. I love the idea of getting my little one to actually tear a paper lid to get to their Advent treat. I had some ideas to make the project fully mine but unfortunately it didn’t turn out as expected. Instead of the house shaped suggested by Erlend, I went for a triangular Christmas tree shape. It was a bit of a last minute decision. Thanks to this nasty habit of us of not discarding used toilet rolls and my daughter’s impressive stash (don’t ask) I was able to gather 12 toilet rolls at very short notice. Little did I know toilet rolls come in various sizes. 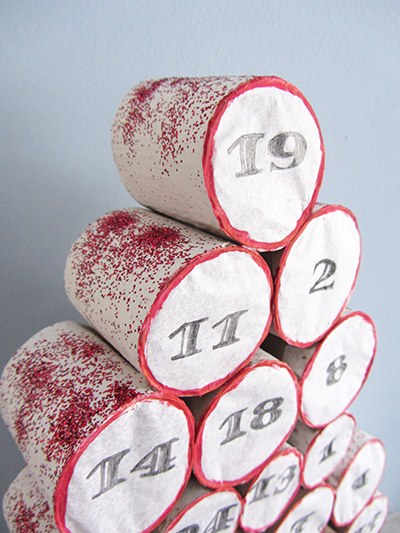 This shows on the middle row: I had to find a way to use the smaller rolls without too much damage to the shape of the calendar. Numbers should not be black. Red would have worked better. I should plan well in advance so I get enough toilet rolls of the SAME size. 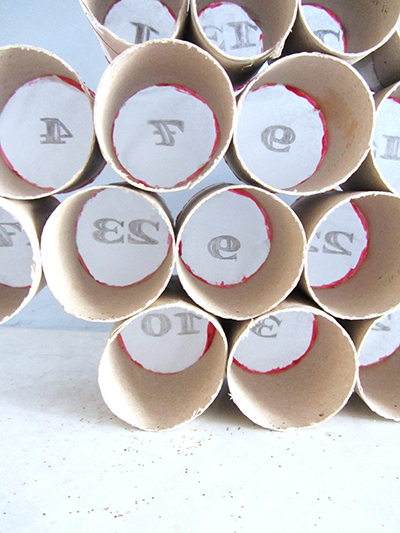 If going for the circular outline on each roll, I should use a marker or a better brush. This should be thiner with neat edges. Remember a 9 can easily be misread as a reversed 6 and the other way around. Did you notice I have two 9 and not a single 6 on my calendar? Should practice my glitter spreading skills before next time! Are your Advent Calendars ready? I would love to see what everybody is doing! I would never have believed that toilet rolls came in different shapes! I like the ‘rustic’ look and love the idea of a mixture of activities and treats. Thanks, turns out they don’t care too much about the activities though.